For a long time there, I didn’t keep a Christmas tree. Don’t ask why, it’s a long story. Sufficient to say I got my Christmas itch scratched through, um, other modes of holiday hoopla. But all that changed two years ago when I broke down and bought a $20 tree at Target to start housing my birds. 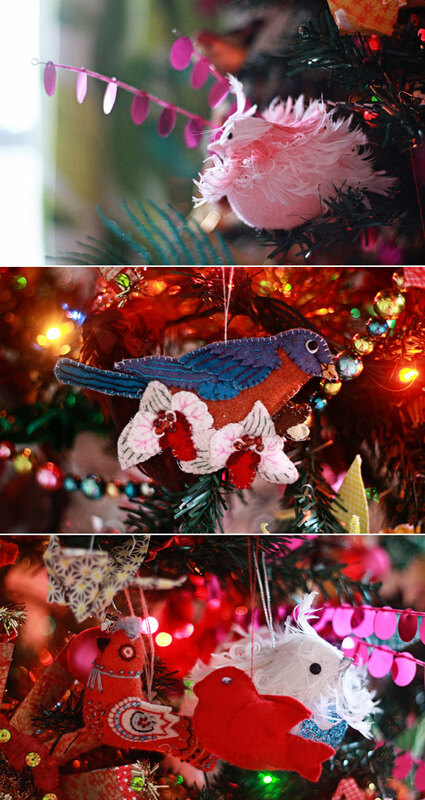 I collect bird ornaments. They used to sit on some branches in a bucket all winter, but now they sit in a proper tree and it makes me giddy every time I see it. No, it’s not a huge tree–no bigger than a fourth grader. And since I tend to hoard, I made myself a promise; I would only collect birds that were handmade, vintage, or truly special–like a memento from a vacation or a from close friend. That way I could keep a leash on the rate of collection and only after a lifetime would I eventually fill the tiny tree with exclusively one-of-a-kind ornaments. Good plan, right? I thought it would take me a lifetime to fill that tree, but this is only my third holiday and it’s so jam packed I had to get an annex tree for the living room (more on that one to follow). This year I decided that the tree needed more sparkle and a little bit of Victorian flair. 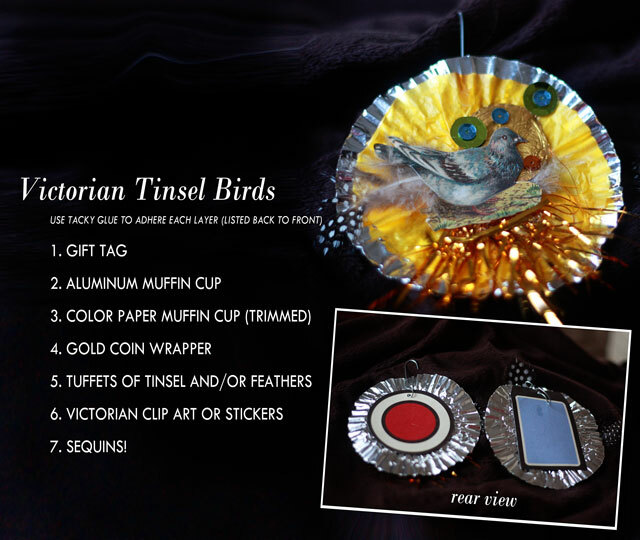 I ordered some German die cut birds from 32 Degress North (they have some seriously cute stuff y’all), and mounted them on cupcake liners with some touches of feathers and tinsel. Besides the birds and the paper gift tags used as the base, I didn’t have to buy a thing. Not sure if that speaks to the ease of this project, or the severity of my craft supply obsession, but you get the idea. I realize not everyone keeps polka dotted guinea fowl feathers in their pantry. 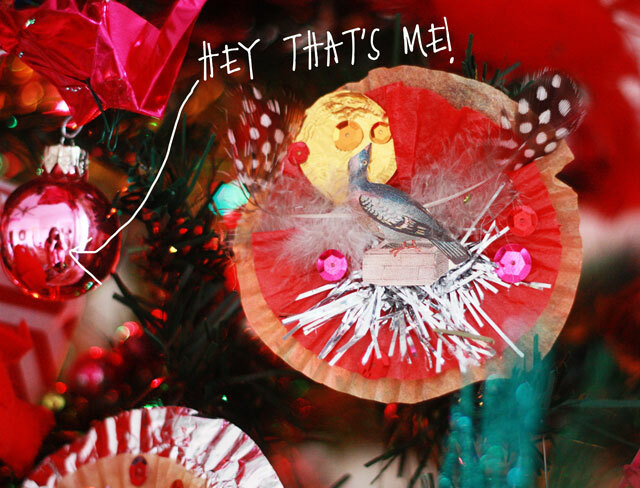 You know what they say in Portlandia –everything looks good when you put a bird on it. Have to tell you!! Each one is beautiful !! Love them all!!! Real birds scare me. Your tree delights me. As always, Peaches, you rock. why are the comments going through Diskus, not Blogger? some of them are getting eaten. I like trees with a theme – and your birds ROCK! One year I took pictures of all the ornaments I had – handmade, given, and so on and it took a few rolls of film (when we used film, of course!) Loved it. Now, with the new cat, I’m afraid to put the tree up with ornaments. He had already turned over the tree with only lights on the table. Ooooooh, pretty birdies! Loving them all! 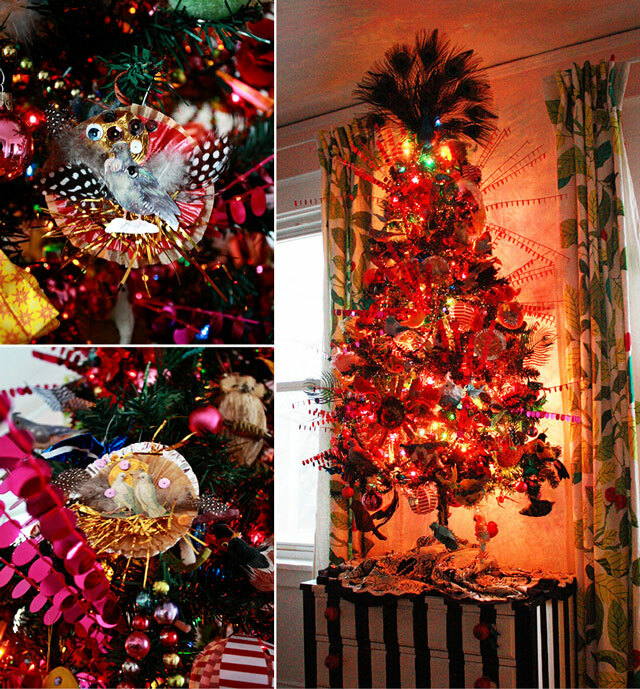 LOVE birds….I see a bird themed small tree in the years to come for me! Too cool! Love your tree. I’m a big fan of “anything and everything” on a tree. 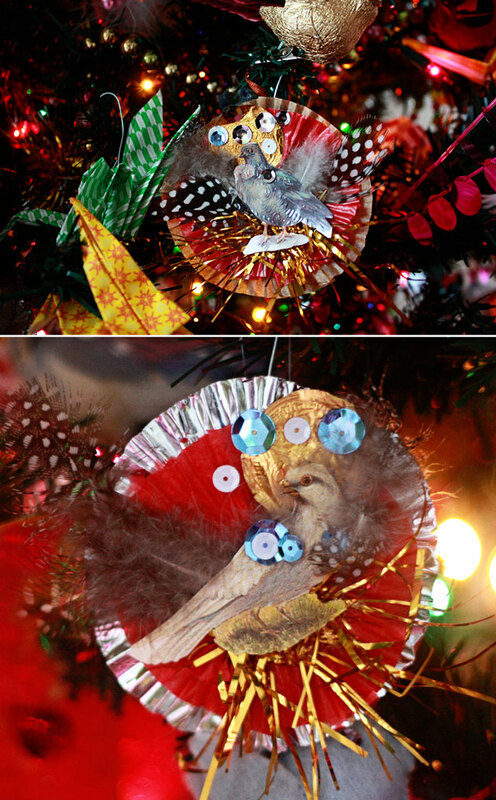 Love what you did to your birdie ornaments. Thanks for making me smile today. These are beautiful as are all of your creations. Next Christmas can you make a BOOK of your crafts?